Newfoundlands are just very large retrievers. The yellow-throated marten (Martes flavigula) is a relatively widely distributed species of marten that is found over a broad swathe of East and South Asia, as well as much of Indonesia. It is the largest marten species in the Old World, weighing as much as 12 pounds, and it was once thought to be dangerous to people. It was once claimed that these martens would pack up and hunt people. These martens do hunt in little packs of three or four individuals, but they don’t hunt people. Instead, they use their pack-hunting behavior to target muntjac and musk deer. This particular one is in a zoo, which is why it is eating a white domestic mouse. With the exception of certain species of otter, I don’t know of any other mustelids that hunt in packs. No other martens do. Tayras sometimes travel in groups, but I don’t think anyone has observed them cooperatively hunting. This animal is about the size of a fisher (M. pennanti). I’ve never heard of fishers killing deer, but for some reason, they do kill both bobcats and Canada lynx, which is a little bizarre. The biologist Roland Kays doesn’t think fishers hunt domestic cats, but the discovery that fishers sometimes prey upon the two North American lynx species should be a little disconcerting for cat owners who let their pets roam in fisher territory. If a fisher can kill one of those animals, it would very easily take a domestic cat. Fishers are very robust martens, and they don’t have to pack up to be quite successful predators. I should note that the Martes is currently a contested genus. 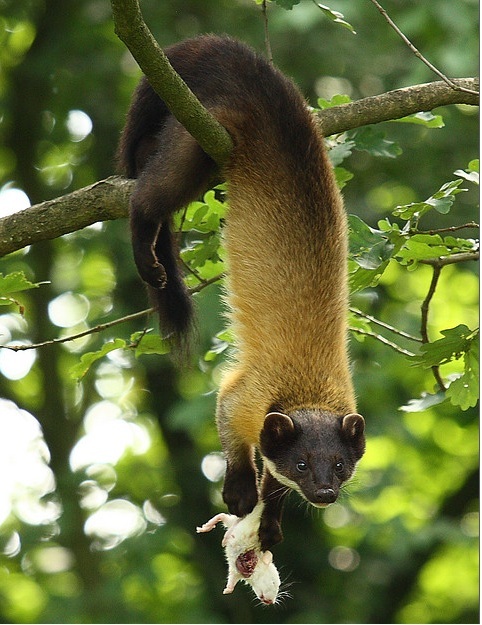 Molecular evidence suggests that the two species of marten in North America, the fisher and the American marten (M. americana) are more closely related to the wolverine or glutton (Gulo gulo) and the tayra (Eira barbara) of Central and South America than they are to the Old World martens. More work has to be done to sort out the phylogeny and taxonomy, but it is likely that our two martens will be given their own genus or genera at some point in the future. When we were kids, all the children in our family would buy hermit crabs as “living souvenirs” of our annual trip to the beach. The crabs were not native. They were imported from the West Indies and sold in massive cages at the various “gyp joint” souvenir shops that unfortunately pollute most vacation spots. When we bought the crabs, we always bought the little crab terrarium that came with them, as well as a several shells that we were absolutely certain the crabs would move into once they outgrew their current domiciles. Of course, they rarely liked the new shells, and I remember one of them dying because it couldn’t find a shell that suited it. On the Outer Banks, virtually every gift shop has hermit crabs for sale. I wonder if they might start carrying glass shells for them. Those tourists who live inland really do need a better selection of shells for their crabs, but it’s next to impossible to get unbroken marine snail shells this far inland. A bad debate tactic I’ve noticed that science denialists like to employ is to point out all the bad things a particular scientist believed as a way of discrediting the scientist and the science to which he or she contributed. It’s really nothing more than an ad hominem attack. For example, how many times does one come across the statement that Charles Darwin was a racist? Let’s keep in mind that Darwin’s views on race are not instrumental to his theory of evolution through natural selection. He could have been the most racially tolerant man in the history of the world, but it wouldn’t mean anything about his ideas. For the record, Charles Darwin was actually quite opposed to slavery, which had been a major source for his nation’s prosperity. However, he was a white, upper class Anglo-Saxon living at the height of the British Empire. He could not have existed without some of the racialist zeitgeist rubbing off on him. But that still doesn’t tell us whether his ideas about evolution through natural selection were valid. Calling him a racist is a distraction from the issues at hand. Similarly, pointing out that one of the founders of ethology, Konrad Lorenz, had been a devoted Nazi is also a distraction. Lorenz was wrong about many things. I’ve pointed them out on this blog. In my critique of the dominance model for dog behavior, I have demonstrated that a lot of dog and wolf science was unfortunately distorted through Lorenz’s work. The notion that domestication dulled the intelligence of dogs is one that can be traced to Lorenz. And it’s not necessarily because Lorenz was once a Nazi scientist. Romanticism had deeply influenced the intelligentsia of the German-speaking world, going all the way back to the early nineteenth century. The Germans saw themselves as wild forest people whose exact natural proclivities and genius were being destroyed by civilization. If one applies those same framework to dogs and wolves, it sees the dog as being a degenerate wolf, a creature that can never return to its wildness and genius. Lorenz is notable because he added another framework to the mix. Wolves are native to Germany, just as the “German race” is, but he contended that most dogs were derived from golden jackals, which are native South Asia, North and East Africa, and the Middle East. It has been argued that Lorenz created this dichotomy through his association with National Socialism. Lorenz preferred dogs that were of this wolfish heritage. It has been suggested that the aureus dogs are a mirror of the Semitic people with whom we know that the Nazis hated with such a venomous and pathological passion. Now one can denounce Lorenz all you want. I don’t see how this helps the discussion. Yes. He was Nazi, but he later did all he could atone for his associations. He was very active in Austria’s Green Party, and he worked very hard to make amends with Niko Tinbergen. who was actually held as a prisoner of war when the Nazis took over the Netherlands. Tinbergen was one of the men who would share the Nobel with Lorenz, but as a Dutch citizen who was vehemently opposed to the Nazi occupation of his homeland, it would take many years before the two became reconciled. 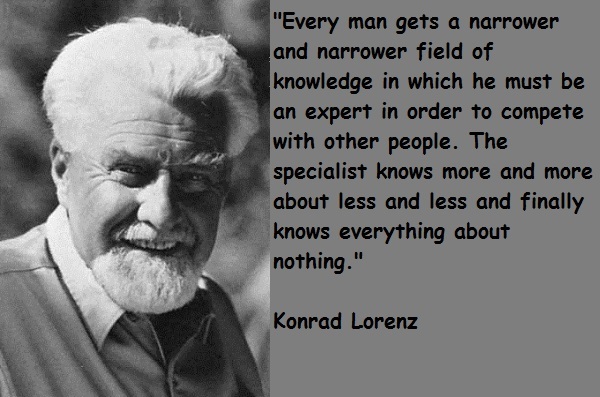 Tinbergen’s methodology has wound up being a lot more significant than that of Lorenz. His “Four questions” have played a major role in ethology and the emerging field of sociobiology. But Tinbergen was no more a prophet than either Lorenz or Darwin. All of these men were trapped in the time and society in which they lived. Scientists are not religious prophets. They can only contribute knowledge within the paradigms in which they exist. Religious prophets are supposed to infallible, but no scientist regards any other scientist, whether from the past or present, as being without error. Science is really about correcting error. Lorenz was quite wrong about aureus and lupus dogs, but if one reads Man Meets Dog, he was definitely picking up on something else. Lorenz’s understanding of dogs included large numbers of Western improved breeds, which had definitely been selected for biddability and docility. He didn’t have much exposure to Non-Western breeds, and in the early twentieth century, chow chows are quite exotic animals. Chow chows were not bred to be biddable or docile animals in their homeland. They were meant to be hunters of a variety of game, and they were also meant to be used as a food source. They were also expected to be fierce guard dogs to protect their owners’ properties. Lorenz saw in this relatively unimproved breed a lot of wolfish characteristics. They were quite one-mannish. They were not demonstrative. They were very different from all the Western dogs that he would have known in Central Europe at that time. And we do know there are pretty extreme differences in behavior between Western and Non-Western dog breeds. Shiba inus and basenjis are quite different from golden retrievers and papillons. Today, we would say that selective breeding within their respective cultures has produced such different temperaments in different breeds. But in Lorenz’s day, it was worth postulating that some dogs were derived from a different species. Of course, Lorenz later rejected these theories when he began to look at the literature that compared wolf and jackal vocalizations with those of domestic dogs. Dogs produce sounds that are very similar to those of a wolf. Further, the genetic evidence shows that the wolf i the primary– if not sole–ancestor of the domestic dog. There might be some genes from other species in there, but the dog is genetically so similar to Eurasian wolves that it is no longer valid to consider them a separate species from the wolf. Lorenz accepted all of these findings, just as he accepted that Nazism was an unmitigated evil. Scientists change their minds with the evidence. Science is built upon what we already know, even if what we already know comes through the distorted prisms of culture and prejudice. Eventually, science can correct the error. That’s what’s so beautiful about it. West Virginia St. John’s water dog? This is Lassie, one of the last two “pure” St. John’s water dogs. 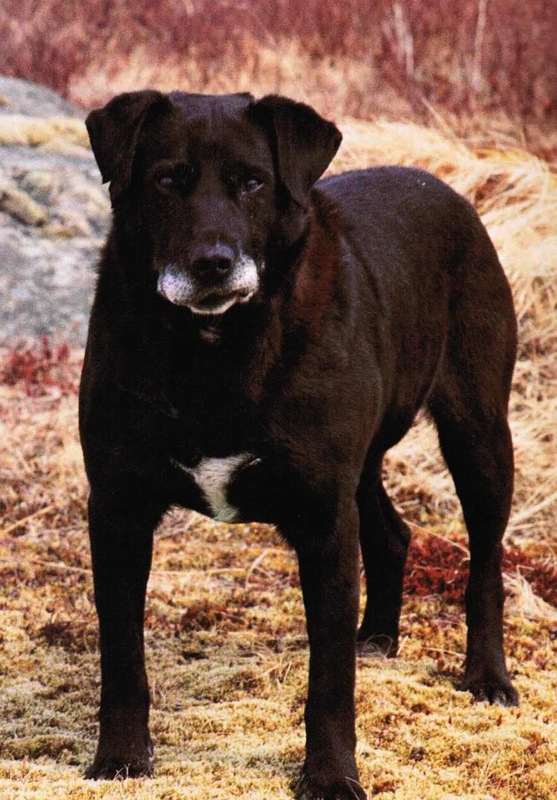 Despite the name, he was male, and he was featured in Richard Wolters’s history of the Labrador retriever. Although he had a thicker coat and more high-set ears, it always amazes me how much he looked like Kizzy, the late “golden boxer” (golden retriever mother, brindle boxer father). Her mother must have been a golden retriever that was masking dominant black with e/e preventing any black pigment from appearing on the fur. 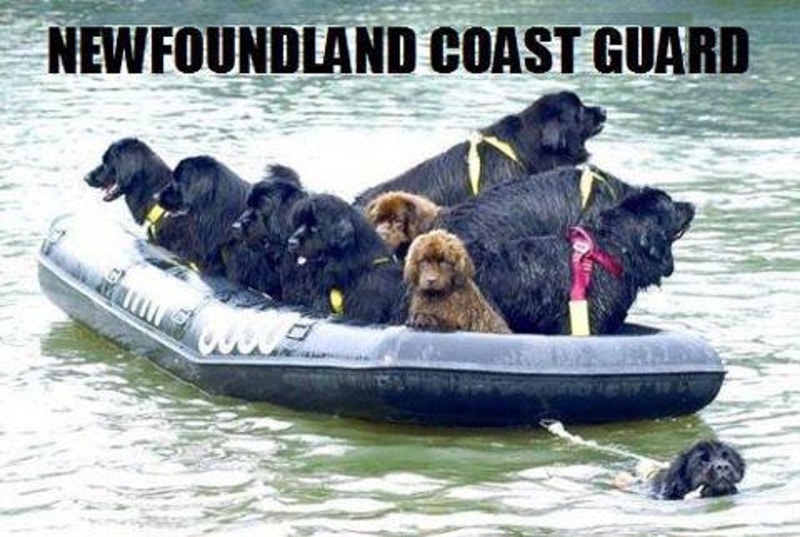 Those St. John’s water dog genes are quite prepotent. Many golden retriever crosses are mistaken for Labradors or Labrador crosses because they are black and smooth-coated. But the golden retriever traits of a feathered coat and red-to-yellow coloration are recessive, and they are easily lost when crossed to other breeds. But I can tell you that both her parents were known. The mother was so definitely a golden retriever that no one would mistake her for anything– and she had papers. People have a very poor understanding of the inheritance of coat and color in domestic dogs. 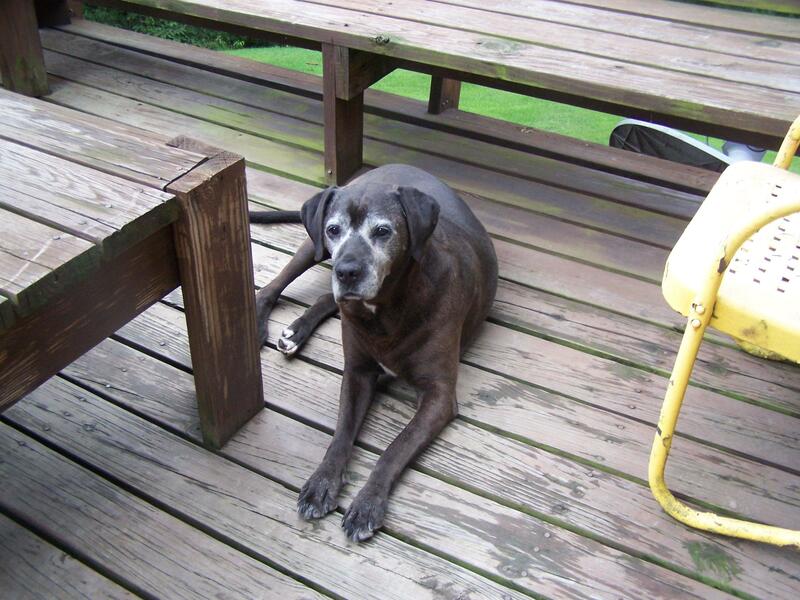 I bet she would have been listed as a Labrador mix at any shelter, even though she had no Labrador ancestry. This sassafras leaf is from a tree that was felled in last month’s storm. In that time, its chloroplasts have died off, and now it looks very much like what a sassafras leaf would look like in the middle of October. 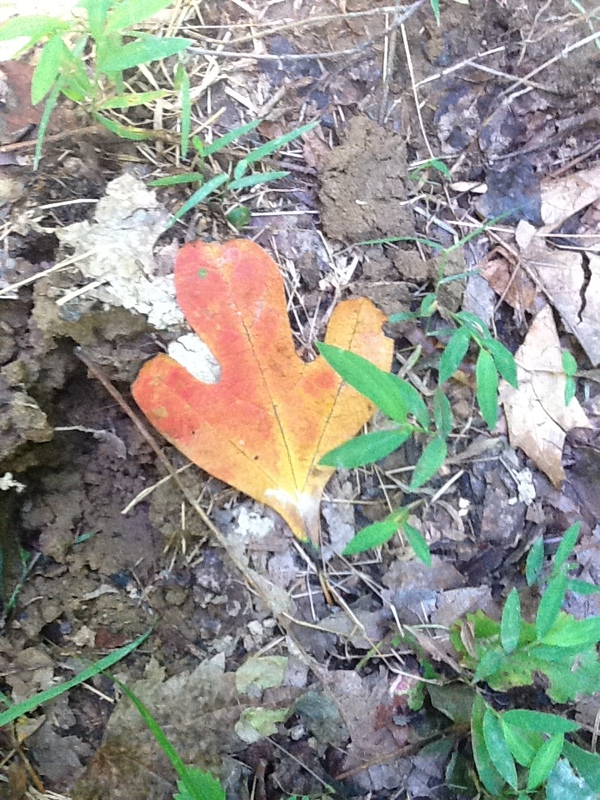 This leaf is a reminder that fall is not far away. The cicadas have started to buzz, and the katydids are calling at night. Summer is reaching its climax, and soon it will fall into the balmy days of September, then the frost, and then the snow. Sassafras (Sassafras albidum) is a very common tree around here. It has three leaf shapes. There is this lobed shape, an oval shape, and a mitten shape. 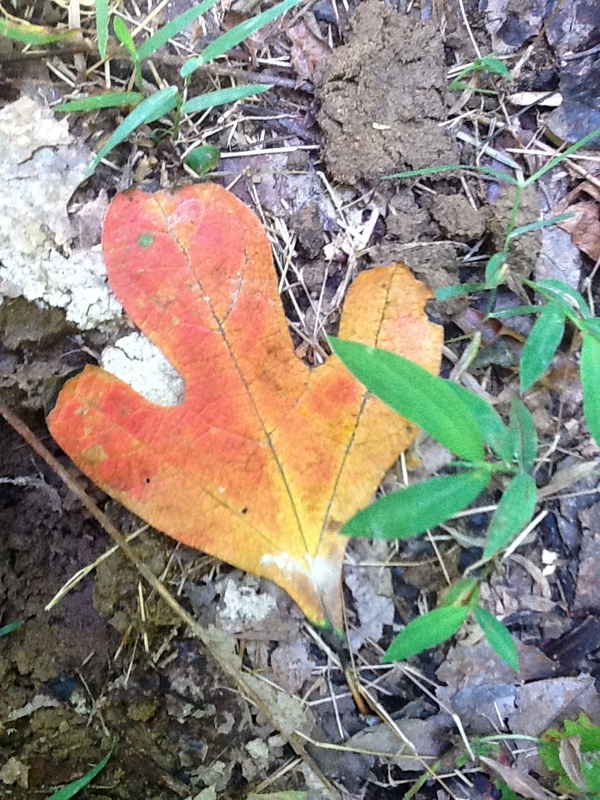 At one time, the roots of the sassafras were used to make a nice country tonic. Sassfras tea was commonly recommended as a blood thinner and as an antisceptic, and it has a very pleasant taste to it, something akin to root beer. However, sassafras tea contains safrole, which the USDA considers a potential carcinogen. So you can’t buy sassafras tea anymore. But I must admit to having tasted it. When I was a kid, my grandpa cut down a sassafras tree at the corner of his yard. The roots were boiled, and we all had some sassafras tea. I guess trying it just once won’t hurt. 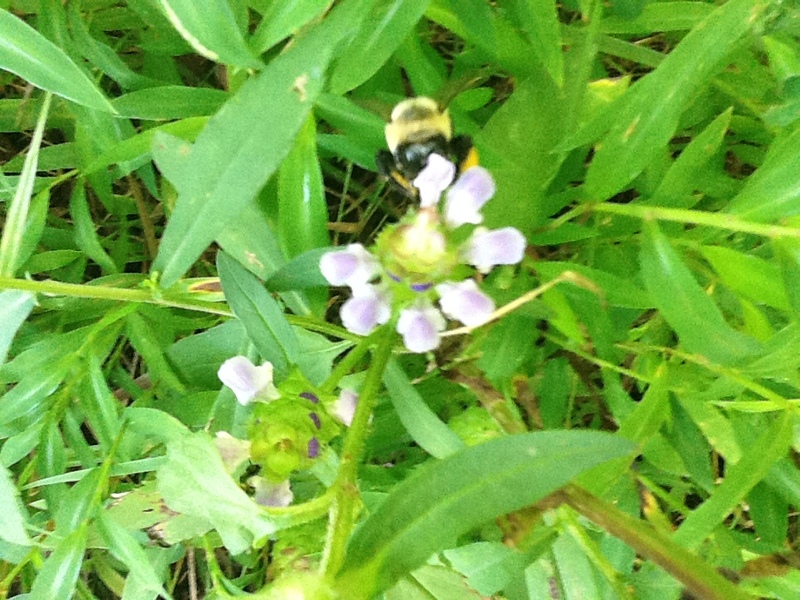 I somehow managed to get some shots of a bumblebee doing its thing. 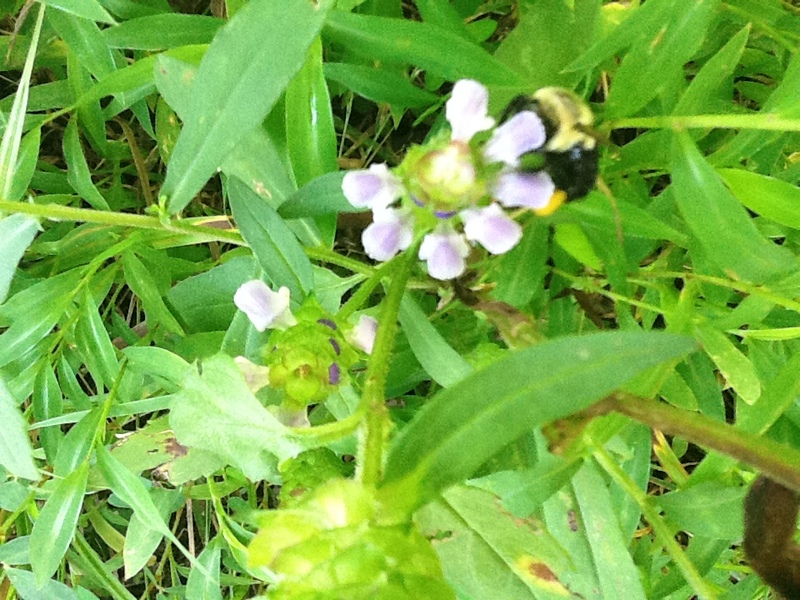 These bees are very hard to photograph.